With Canada set to sign on to a global United Nations agreement on migration next week, Conservative Leader Andrew Scheer says adopting the pact would be tantamount to erasing Canada’s borders. Scheer said his party strongly opposes the agreement and has called on the Trudeau government not to sign it. “[The compact] gives influence over Canada’s immigration system to foreign entities, it attempts to influence how our free and independent media report on immigration issues, and it could open the door to foreign bureaucrats telling Canada how to manage our borders,” he told reporters on Parliament Hill on Dec. 4. During question period that day in the House of Commons, Prime Minister Justin Trudeau dismissed Scheer’s concerns, saying his government is committed to a healthy immigration system. “We are going to continue to stand up for immigration, knowing that defending diversity is a source of strength and welcoming people through a rigorous immigration system from around the world is what has made Canada strong and, indeed, something the world needs more of, not less of, like [the Conservatives] want to bring in,” he said. Although the pact is not formally binding under international law, it has proven to be controversial. The United States and Australia have refused to sign on, and at least six EU member nations are reportedly walking away, including Austria and Hungary. Canada was involved in driving the agreement forward, and Ottawa will closely review the document before formally signing it, according to media reports. During question period on Dec. 4, Scheer suggested to Trudeau that instead of “signing international agreements that erode our sovereign right to manage our borders,” he should focus on fixing the issue of migrants crossing illegally into Canada from the United States. The cost of the increased numbers of migrants claiming asylum after crossing the border illegally was noted in a report last week from the office of the Parliamentary Budget Officer (PBO). The report found that, as of September 2018, more than half of refugee claims made were made by irregular migrants originally from Nigeria and Haiti. 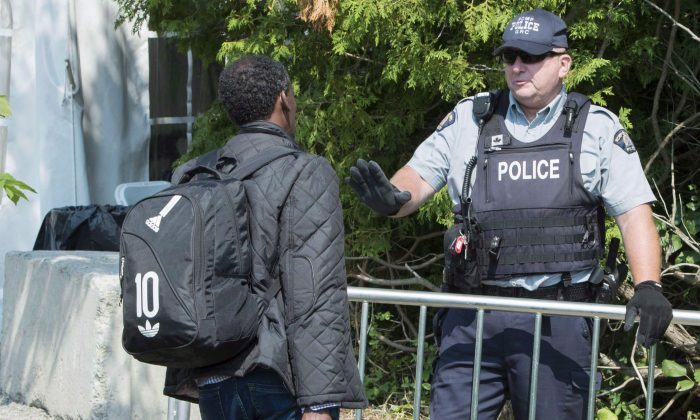 The Immigration and Refugee Board (IRB) estimates that almost 35,000 people have entered Canada illegally since 2017. According to the PBO report, the IRB had the capacity to hear 24,000 claims per year in the 2017 to 2018 fiscal year. However, during that same period, they faced more than double the number of claims they could handle. This has resulted in significant backlogs in the claim process, further slowing the system down and driving up costs. The PBO estimates that it costs the federal government $14,321 on average for each irregular migrant’s entire claim process during 2017 to 2018, with over $300 million estimated costs during that same period. During this time, irregular migrants need access to temporary housing, social assistance, and education among other things—costs borne by provincial and municipal governments. “In addition to the social and human costs of lengthy delays in the system and ongoing uncertainty for legal asylum seekers, we now know the financial cost to taxpayers,” Scheer said in a Nov. 29 statement. Irregular migrants are taking advantage of a loophole in the Safe Third Country Agreement between Canada and the United States. The agreement requires both countries to refuse entry to asylum seekers, as both countries are considered safe for refugees. But it applies only to those who arrive at official entry points. Asylum seekers who cross outside official points of entry cannot be turned away and are allowed to stay in Canada while their claim is processed. This can take years, and will take even longer if the migrants appeal a finding not in their favour. The PBO report also identified a phenomenon where someone enters Canada irregularly, files a refugee claim, and subsequently acts as an “anchor relative” for other family members, meaning family members can enter at a port of entry and not be considered illegal migrants. The 2018 budget allocated $173.2 million to the IRB and the Canada Border Services Agency to deal with illegal migration. Border Security Minister Bill Blair has said Canada is just one of many countries impacted by the increase in global migration.